Jurassic World 2 is more real than ever and it is officially time to get excited. The movie has been shooting for a little more than a week in England but we haven't really seen any set photos emerge yet. Bryce Dallas Howard did share a photo of her chair from the set, but that wasn't all that thrilling. That has all changed, thanks to producer Frank Marshall who has shared the first official photo from the set of the Jurassic World sequel and it is extremely encouraging. The producer took to his Twitter account to share this first Jurassic World 2 set photo. He has been really active in sharing updates, but this is the first official photo from the movie that has been released and that is significant. The photo features a young girl looking at a dimly lit museum room filled with dinosaur skeletons. It may not have any actual dinosaurs in it, but this photo gives off that perfect childlike sense of wonder vibe that many of us felt when we saw the original Jurassic Park all of those years ago. It is more than enough to get fans of the franchise feeling good about things. Here is what Frank Marshall had to say about the photo. "First photo from the set. JW2 lives! #JW2 #JurassicWorld"
As for the girl in the photo, it would be difficult to say for sure who she is, but last year we reported on a casting call for a new character who was set to appear in Jurassic World 2. The character is named Lucy and will reportedly be 9-years-old. Not only will she be appearing in the movie, but she is reportedly going to be a main character. It is very possible that this is who we are seeing in this set photo. There is something about the idea of seeing a Jurassic Park movie from the perspective a young child that will definitely resonate and hit home with plenty of viewers. It might be the perfect way to get people on board early for Jurassic Park 5. Universal hasn't released any official plot details for Jurassic World 2 yet, but it has recently come to light that the movie will probably be dealing with the dilemma of what to do with the dinosaurs now that the park is shut down and what rights they will have. This was alluded to via a couple of domain names that the studio recently purchased; IslaNublarRescueMission.com and AllCreaturesHaveRights.com. It also seems that there will be some kind of rescue mission taking place. Some rumors suggest that it will be to save the dinosaurs from government officials who want to weaponize the dinosaurs, or kill them off entirely. Another rumor points to the possibility of a volcanic eruption threatening to wipe them out. 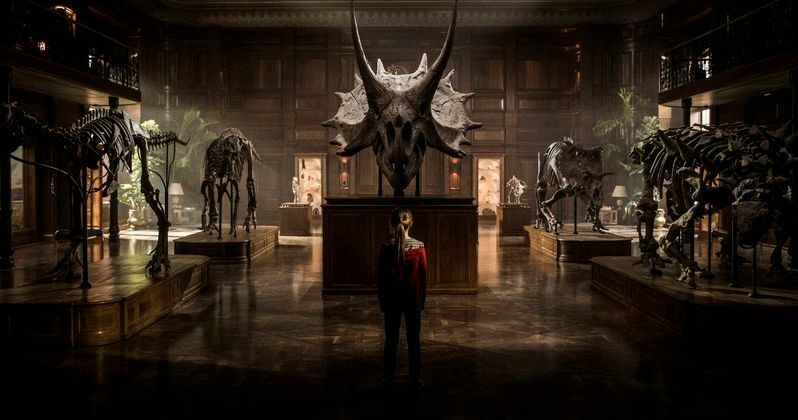 The fact that this first set photo is showing us dinosaur bones and not actual dinosaurs could also be alluding to a possibly grim fate awaiting the man-made prehistoric creatures in Jurassic World 2. Related: Can Ant-Man and the Wasp Beat Jurassic World 2 at the Box Office? Jurassic World 2 isn't the official title but a recent update to Universal's website, which was quickly altered, suggests that the title could be Jurassic World: Epoch, but that has yet to be confirmed. The cast for the movie includes Chris Pratt, Bryce Dallas Howard, B.D. Wong, Toby Jones, Rafe Spall, Daniella Pineda, James Cromwell, Geraldine Chaplin and Ted Levine. Jurassic World 2 is written by Jurassic World director Colin Trevorrow and Derek Connolly. The movie is being directed by J.A. Bayona and is set for release on June 22, 2018. Be sure to check out the set photo for yourself below.